This post is for PhD Economics Carrel owners, with instructions on how to mark their space as “occupied” or “available”. By marking your space “occupied” or “available”, you are giving other students the chance at using your space when you know you will not be using it. When another student requests to book your space, it will be automatically approved. You will get an email notification about it. If the space was marked available by mistake, please rectify on the schedule, and contact the student who booked it directly. We are using the A&S-wide calendar room booking system. By default, spaces are “available”, so you must add a series of recurring events to claim your space as occupied at the start of each term. This process should take about 10 minutes per semester, depending on the complexity of your schedule. 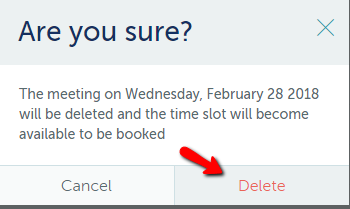 In the example below, we go through the process of logging in, creating a series of recurring bookings, and then deleting the ones where the room should be available. If you prefer another method (e.g. playing with the recurrence for availability), you are free to mark the space as occupied as you see fit! 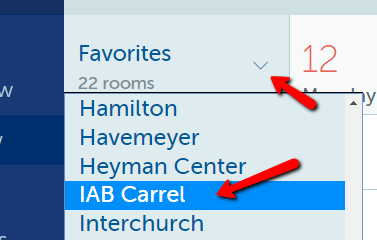 Your “favorites” should by default be all the carrel space. To simplify this view, you can un-star any room that isn’t yours by clicking on the star. Scroll down until you find your space, e.g. “11.9” in this example. 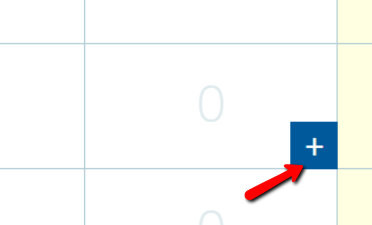 When you hover your mouse over a day, a blue “plus” button will appear. Click it on today’s date. Keep recurrence type to “daily”, and click the “recurrence end date” to choose a date in the future. This will automatically fill in every day from today until that date with the “occupied” booking. You can also change the number in the “repeat” box. Note that the maximum number of repetitions is 100. If you’d like to pre-occupy your space for longer than that, please create a new recurring event. Selecting the recurrence end date will automatically adjust the repetition number. Click the “save” button. The next step is to remove those days which you want to make the space available to your fellow students. Click the “edit” button. Your recurring events will be listed. To make a space available, simply delete the recurrence – roll your mouse over the event, and the “delete” button will appear for you to click on. Confirm the deletion, and repeat for any further days you’d like to make available. If you click back on the weekly/monthly view schedule, you can confirm that your space is “occupied” when you are using it, and blank when it is available for others to book.